SUMMARY: Look Ma, no hands!! If you’re one of those people who for whatever reason finds themselves reinstalling Windows XP on your machine frequently, this might be something worth trying. Wouldn’t it be nice to pop your Windows XP CD in, hit the space bar at the “Boot from CD” prompt, walk away and come back an hour later to a nice fresh install? button repeatedly. If you don’t have to babysit your install, why do it? I can think of many other things I’d rather spend that half hour to forty-five minutes doing. I’ve been enrolled in classes at a local college for a while now, and recently we went through Microsoft’s 2272B Course (Implementing and Supporting MS Windows XP Professional). This article outlines the same procedure for creating an unattended install disk covered in that course. us to expand much further on the procedure outlined here. For today, we’ll just cover the basics however. In a separate article soon, we’ll get into more advanced techniques. What can be done unattended is quite amazing. Note: I’ve used the conventions that your current install is located at “C:”, and your optical drive is “D:”. Change the drive letters used here as applicable. installation. Changing or adding to these settings also allows for automated installs on different computers. They don’t have to be of identical configuration, but the closer they are the easier things go. AMD machine, and then get put right into an Intel based system. A single floppy doesn’t have enough space to be this versatile though, so for now, we’re limited to a single system, or close to identical ones. Start out by putting your Windows XP CD in your optical drive. Wait for the “Welcome” window to open and hit “Exit” when it does. Double-click “My Computer”, and then double-click your hard drive (C:). Create a new folder here at the root of C: named “Deploy”. In reality, the only file of the lot we’ll need is the Setupmgr.exe file. For what we’re trying to do, we need to use the Setup Manager Wizard. Double clicking on the Setupmgr.exe file in “C:Deploy” launches the Setup Manger Wizard. Wizard will save your answers in a text file, which you will eventually put on that floppy disk. Let’s create the answer file next. He’s got a small baking business there in Anytown (what else would a fellow named “Doe” run? ), and he’d like to make an unattended install for his office computers. set up these files to be used with multiple machines. After this page, check the box to accept the license agreement, and click “Next”..
Here’s where you start entering your personal info. You should at least enter a name here (organization may be left blank). In the following screen, select the display settings you usually use, and click “Next”. After that, select your correct time zone, and click “Next”. accuracy of your entry in this page. You won’t get an “invalid key” error while building this file, but you sure will when actually installing Windows using the unattended floppy disk. On the next page, you’ll need to enter a name for your computer. Enter something (you can always change it later), or the unattended install will halt here, awaiting you to enter a name. Click “Next” after entering the name. It’s very good practise to use a password here, and best is to make it “complex”, using letters, numbers and characters. A complex password might be something like: /BjBsP4/. A real simple complex type password, using both upper and lower case letters, numbers, and characters. Whatever you do use, remember it!. when the text file we’re making is done, it’s encrypted in the file, making the floppy more or less useless to someone who gets a hold of it. If you need to specify an IP address, or DNS Server address, here’s where you can do this. If your IP gives you an IP address (or you have a router that does DHCP), you can leave this on the default “typical settings” button. Where John only has a couple computers, he doesn’t have a domain set up. He’s been using the “MSHOME” workgroup since the Win98 days. If this is your only PC, you can use the defaults, or if you have several computers on your network, configure these settings as needed. the unattended install if left blank. Regional Settings (the next page): Just leave the default setting, and click “Next”. websites? Perhaps adding support for Chinese/Japanese characters here will save a bit of time later on. Make your choices (or choose none), and click “Next”. for Internet Explorer, he’ll wind up at this very site here. Enter you selections, or take the default, and click “Next”. Installation Folder : Ensure “A folder named Windows” is selected, and click “Next”. it and install the appropriate drivers anyway, so you can leave this blank and just click “Next”. On this page, you setup any commands to run when you first log on to the PC after installing (usually right after installation finishes). I’ve entered dfrg.msc here. This will automatically initiate the Windows Disk Defragmenter to run. Enter the command, click “Add”, and then “Next”. Click “OK”, and your done with the Wizard. HOORAY! Now, take your floppy disk, and format it. 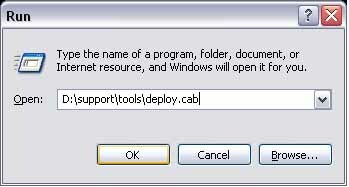 Open the C:Deploy folder, and right click the new file (unattend.txt) you created. Rename this file to winnt.sif. 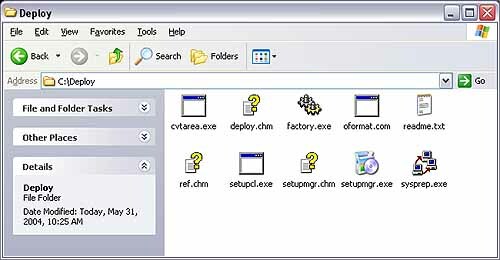 Depending on what you entered while creating this file, there may be one or two other files in the folder as well. These would be Unattend.bat and Unattend.udb. The unattend.udb will only appear if you listed more than one computer. These do not need to be renamed. After renaming the file to winnt.sif, move it and unattend.bat (and unattend.udb, if applicable) to the freshly formatted floppy disk in your A: drive. The next time you need to install (or reinstall) Windows XP, set the boot order as you normally would (boot from CD-ROM first) to install the OS. Put the floppy into the drive, and reboot. Windows will automatically look for a floppy disk containing a winnt.sif file. If you’ve already formatted the hard drive (or it’s brand new), Windows will install at the root of C: using the entire hard drive as one partition. If the drive has not been formatted, you will need to do that part of the installation manually, when it comes up during the install. These lines set to these parameters will force the install to stop so you can manually configure these two items. That’s it. Set up the partitions/file system (if applicable as above), go to lunch, and come back to a fresh install of Windows XP. Required: A CD or DVD burner. Next time, we’ll use a CD or DVD burner to make a custom Windows XP install disk. create a regedit.reg file to automatically make some of the changes you make when first installing XP. Administrative Tools on the Start Menu by default? All of these, and much more, can be done with a simple regedit.reg file.